This meal has been a long time coming. Jenny had intended for this meal to happen a month ago; but it appears that the location wasn't all that attractive. 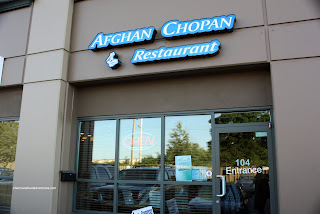 You see, Afghan Chopan is in Surrey. For me, that's perfect since I work nearby. I am so game to try this place out. Being only open for dinner, I have never been able to make it there. Surprisingly, TS/JS from Eating Club Vancouver were game as well. TS rarely ventures out of Vancouver for eats, so this was a real stretch for her. To illustrate her lack of knowledge of anything out of a 8 block radius of her house, TS thought it would take an hour to get to Afghan Chopan from her place. In actuality, it would only take 30 minutes. You see, things are not as far as they seem! For some inexplicable reason, just as I was about to leave the house, Miss Y calls me up and ends up joining us for dinner. If it wasn't annoying enough that she has to put up with my picture-taking antics normally, she would need to bear with Kim and Jenny taking photos as well. 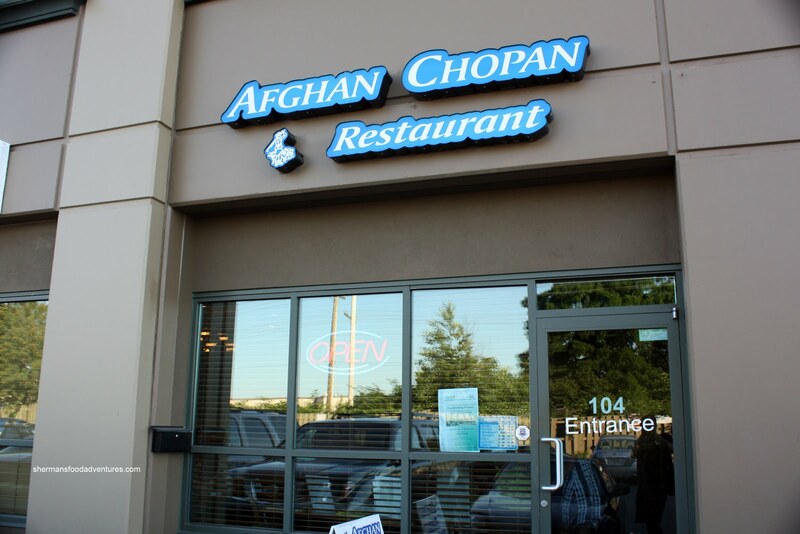 If you've never ventured out to these parts of Surrey before, Afghan Chopan is located in the unlikeliest of places. Located amongst industrial parks and other businesses, it is actually a bit difficult to locate even if you have a GPS. Trust me, I was driving through the parking lot and wondering if the place actually existed. It does; but hidden quite well on the Northeast corner of the complex. When we arrived, JS already had a plan. Apparently, she had perused the menu and figured out the best deal among the combo dinners. Apparently the Kebab Combo seemed to offer the most amount of meat for the money. Ah yes, nothing beats the inherent deal-seeking gene in us Asians... With that established as the "meat" of our meal, w e proceeded to add an order each of the 3 available appetizers. The first to arrive was the Bolani, which resembled bannock. However, in this case, it was stuffed with a thin layer of potatoes. 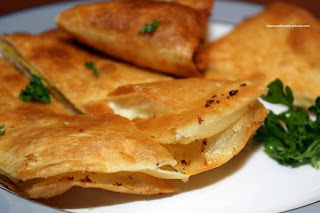 This crispy and fluffy bread went well with the 2 provided chutneys - Raita and Cilantro. The other 2 appetizers were closely related with the Mantu, being a meat dumpling stuffed with ground beef and onion while the Ashak, being a veggie dumpling, stuffed with leeks and coriander. 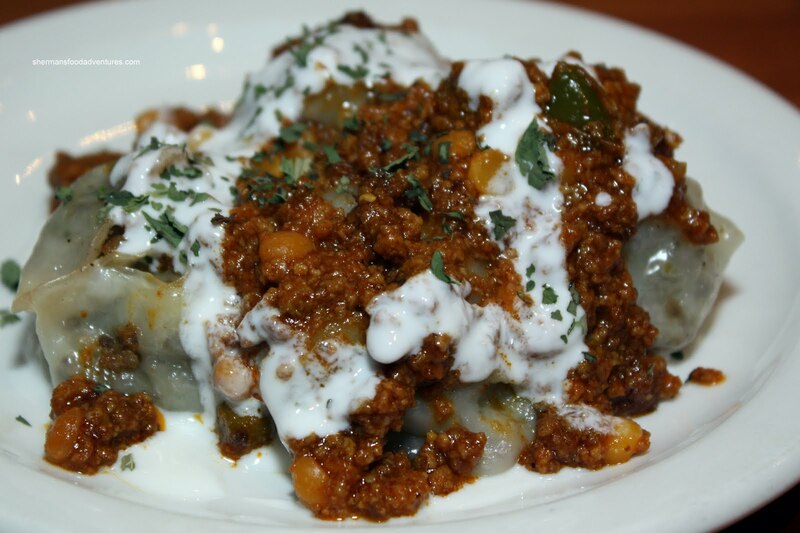 Both were topped with the same meat sauce, yogurt and dried mint. 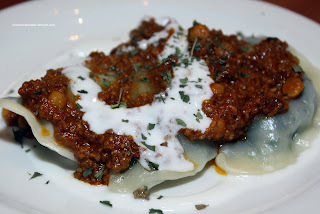 If I had to choose, I much preferred the Ashak since the leeks provided both a textural and flavour contrast not found in the Mantu. However, the Mantu had some kick with a multitude of spices present. 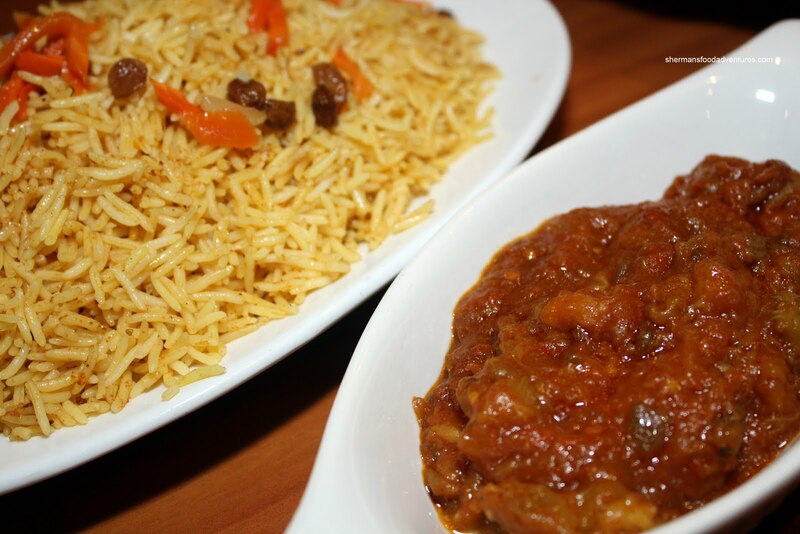 We also added an order of the Qabeli Pallow which consists of braised beef shank hidden beneath basmati rice with carrots and raisins. The daily vegetable dish was served on the side. I believe it was eggplant? As for the beef shank, it was indeed very tender, mild-tasting and almost possessed a braised lamb-like quality to it. The rice was just how I like it, soft while still chewy. The raisins were a nice treat as it provided a natural sweetness. 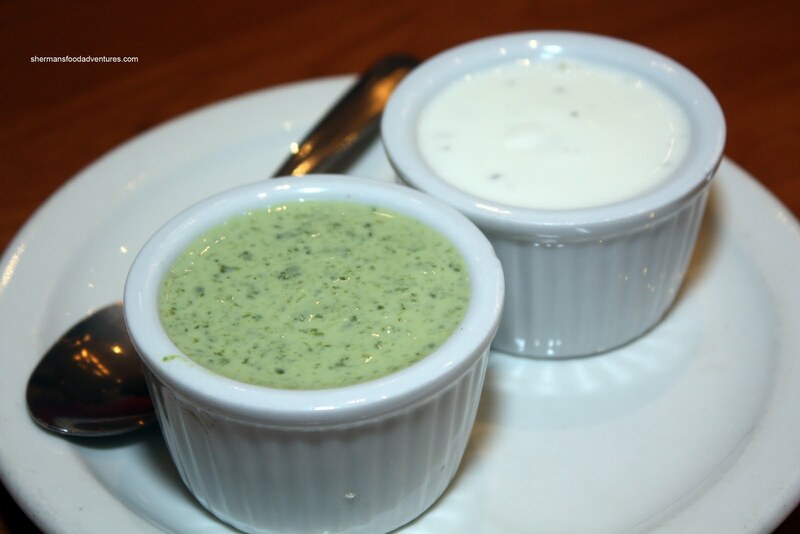 I wasn't particularly enamored with the mushy veggie side dish. It was tart and goopy. This is probably just a matter of personal taste and has nothing to do with the execution. 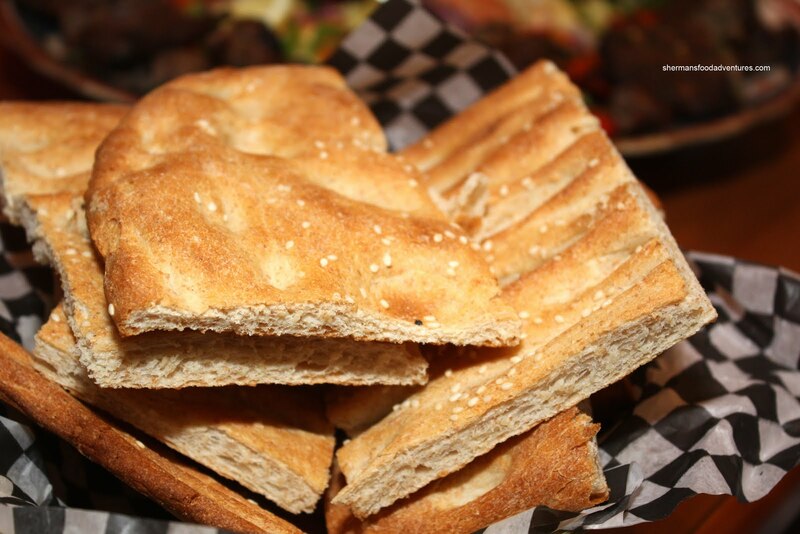 Finally, the star of the show, the Kebab Combo, arrived on a really large platter. 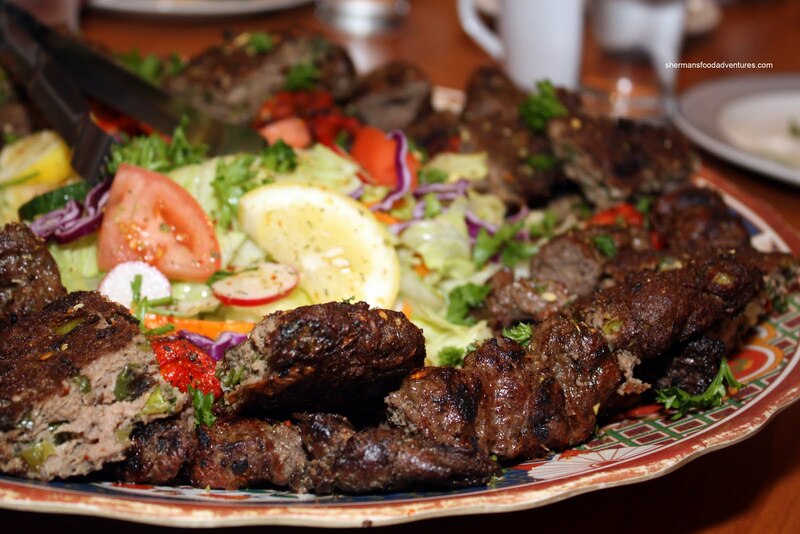 It consists of the following kebabs: Chopan, Tekka, Chicken, Shami and Chaplee with tossed salad in the middle. If you look at the picture with all the meats, starting from the left, the Shami (ground beef mixed with onions, garlic, chili peppers and spices) was almost meatball-like and quite mild. Looking like a burger patty, the Chaplee consisted of ground beef with herbs, spices, green onions and coriander. I found it a tad spicy and very flavourful. 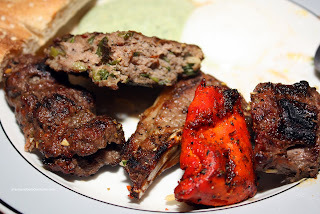 Next were the Chopan or lamb kebabs which seemed more like mini-chops. I found them to be overcooked; although they were still tender and well-seasoned. The Chicken Kebabs resembled tandoori chicken; but don't let the colour deceive you. They were extremely mild and tender. The Tekka, which is top beef tenderloin cubes, were tender while other pieces tended to be quite chewy. I guess it depends on how much it was cooked. 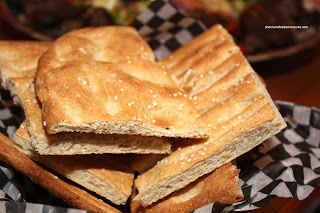 The accompanying Naan was nothing like the Indian version that we are all accustomed with. Rather, the one here was appreciably thicker, denser and chewier. To me, it reassembled bread with sesame seeds on the outside. In terms of personal taste, I wasn't a huge fan of it. By no means is this a criticism of its preparation though. By the time we finished most of the food, we were all quite stuffed. Despite not looking that impressive when it arrived, the kebab platter had more than enough meat for all of us. Since I've only been to one other Afghan restaurant in my life (The Afghan Horsemen), it is quite difficult to do a fair comparison. Therefore, from a purely eating enjoyment point of view, the food was generally quite good. Sure, some of the meats were cooked well-done; but that is the way it is prepared. By focusing on the flavours alone, I found some of the spices quite complex and tasty. That in itself made for a good meal, especially with the given dining companions. I'm glad you did a review of this, Sherman. I'm going there with my class next week and wasn't sure if I actually wanted to eat there. Darina, it wasn't spicy. But then again, I like spicy. I'm sure you'll find something good on the menu.